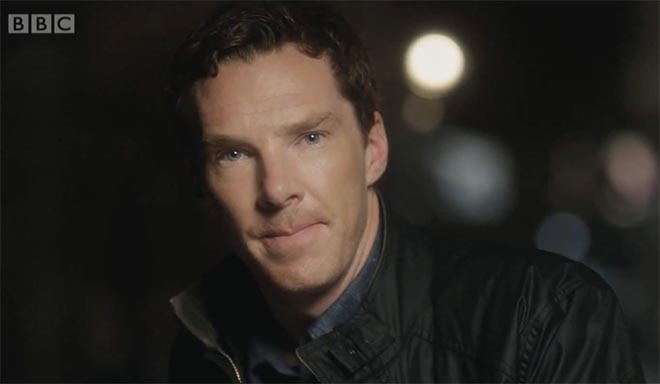 BBC has launched “A Lifetime of Original British Drama”, a trailer promoting the 2015 drama season, starring Benedict Cumberbatch. Benedict reads William Shakespeare’s monologue All the World’s A Stage, from As You Like It, as the trailer celebrates moments from seminal dramas past, present and future. The seven ages of human life are used as a framework: infancy, whining schoolboy, the lover, the soldier, the justice, old age and incapacity. The interactive version, online at bbc.co.uk/originalbritishdrama, allows viewers to click on the hotspots to watch previews of upcoming dramas. Upcoming dramas in the trailer include The Casual Vacancy, Esio Trot, The Missing, One Child, The Interceptor, Wolf Hall, Banished, Strange And Norrell, and Poldark. Dramas from the past include The Singing Detective; House Of Cards; Tinker, Tailor, Soldier, Spy; This Life, Pride and Prejudice; Criminal Justice; Small Island; Spooks and Life On Mars, The 7.39; The Honourable Woman; Burton and Taylor; Our Zoo; The Shadow Line and Our Girl. Current dama series highlighted in the trailer include Doctor Who, Last Tango in Halifax, Luther, Sherlock, Call The Midwife, Death in Paradise; Peaky Blinders; Line of Duty; The Fall; The Hollow Crown; EastEnders; and Happy Valley. William Shakespeare’s As You Like it, spoken by the melancholy Jaques in Act II Scene VII.